Step 1. Mix 1 cup of water with ½ cup of butter and ¼ tablespoon of salt into a pan and wait for it to boil on high heat. Step 2. Once the mixture is boiling, use a wooden spoon and slowly add 1 cup of all purpose flour to the mixture. At this point, lower the heat and stir for one minute until the mixture forms a ball. Step 3. Remove the dough from the skillet and stir as you mix the three beaten eggs into the dough. Transfer the ready dough into an icing pipe/pastry bag. Step 4. Add around 5-7 cm of vegetable oil to a thick pan and heat it until it reaches 360 degrees Fahrenheit. Step 5. Squeeze the dough straight into the pan with boiling oil, use scissors to make the desired length. Fry a few pieces at a time until the become golden-brown. Step 6. After you remove churros from the pan, mix with sugar and cinnamon immediately. Step 7. For the chocolate: dissolve 1 tablespoon of cornstarch into 2 cups of milk until it is completely mixed. Step 8. Add dark chocolate to the mixture and place it in a saucepan for heating. Melt the chocolate while using medium heat. Once the chocolate is completely melted, reduce the heat to low and allow the chocolate to thicken for roughly 5 minutes. 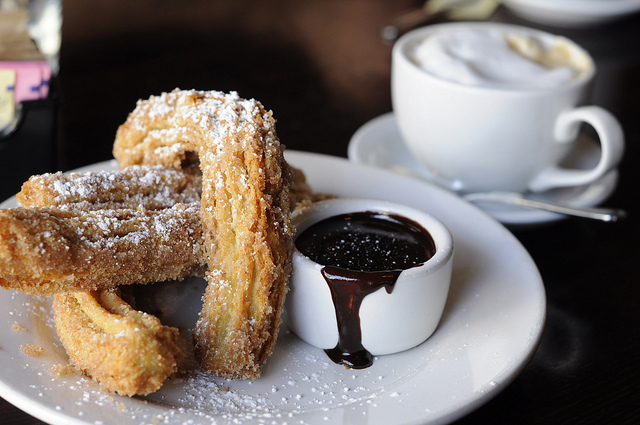 Serve your churros and hot chocolate while they are still hot!